The beautifully-landscaped Hale Kamaole condo property in Kihei sits a mere two-minute walk from Kamaole Beach III (one of the most gorgeous beach on Maui). This lush foliage with grassy lawns property boats two swimming pools, BBQ grills, and free parking. Nearby you can enjoy excellent snorkeling, shopping, dining, and of course — those legendary Maui sunsets over the Pacific Ocean. 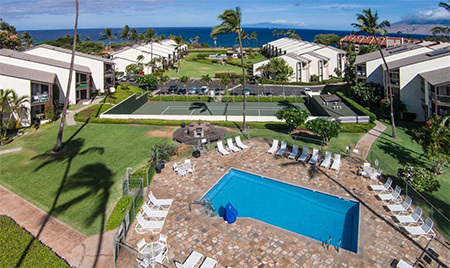 Located on the border of Kihei and Wailea Resort town, this unit is within walking distance to gorgeous white sand swimming beaches, award winning restaurants, Kihei Boat ramp, golf courses and a quick drive to Wailea Town.